New Superman Returns Target Render! Discussion in 'Misc. and Multiplatform Games' started by WhatsHisFace, Apr 1, 2006. EA Tiburon sure knows how to code. Wooot!!! HERE'S THE LATEST ONE TO BE RELEASED; SADLY, IT'S NOT MUCH BETTER THAN YOUR JOKE 'SUPES64' PIC. Well, atleast the robots look half-decent. 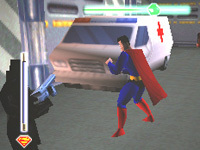 Are you sure those aren't screens from superman 64? Those are completely unfinished. You can tell by how almost NOTHING has detail on it. The robots and the pavement are the only thing with actual texture on them. I'm guess that it's part of a beta phase to test out something in the game, and someone just grabbed a shot for publiuc release. Mwahahahahaha. Man-o-man, that was a horrible game. "Kryptonite mist." That is hilarious, especially since the new one to be released is looking not much better. Just think of the horrible love child game that would come out of this and Batman Begins. No, they are finished assets from the game used to build the target render. For some reason EA have gone with a very cartoony look to the game... thats why the cars look like crap and thats why the robots have more detail. I think it looks fine, and cant wait to play it, i think yalls expectations are wayyyy too high. If they added a ton of texturing, this could be pretty good looking. It looks like they already have some pretty good lighting effects, and the robots don't look half bad. Superman looks more unfinished than awful, but I just hope thats exactly the case, and them not calling it a "creative decision". After seeing some of the stuff done by EA on the 360 (Battlefield 2, Fight Night), I actually have hope they'll pull off something pretty good. Or at least, hopefully better looking than Gun. I can't wait until there are arrows telling us exactly what to do and how to do them, complete with Burnout arrows. those rocks look out of place on the game cover... they just look... weird. other than that, it looks great.. I figured its Superman crashing through a wall or something... It does look kinda weird though. I thought they were shreds of the Clark disguise at first, clearly though they are rocks. Since the beggining of time.